In 1977, Hasse and Stutte issued the first climbing guide and the first climbers started to appear. Meanwhile, local young men came in touch with them and started the first climbing routes. These were An. Tselios, Skarlatos Brothers, S. Athanasiou etc, who together with the German speaking Aris Mitronatsios reached a very high climbing level. In 1979 , an alpine club department called Kastraki Association of Greek Mountaineers was wet up , in co-operation with S.E.O. of Thessaloniki. 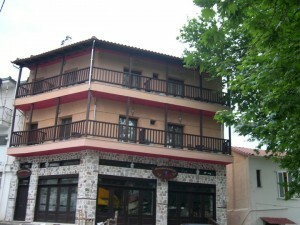 During the ’80s more and more Greeks and foreigners came to Meteora. 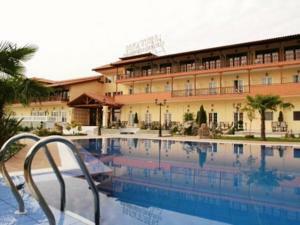 The tourist current of Climbing at Meteora increased tremendously. 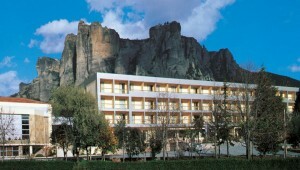 In 1985 the Meteora Climbing Fun club was set up in Germany and Austria by Hasse and Stutte. 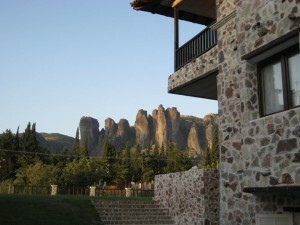 It provided safety bolts to anyone who wanted to open climbing routes at Meteora , for a small contribution to the club. In 1986 the 2n climbing guide was issued (the familiar blue booklet), a complete book, a marvelous work done by Hasse and Stutte. In the same year, the 1rst Pan-European Climbing Meeting was organized at Meteora, with the participation of top contemporary climbers. In 1993 the Committee of Mountaineering Safety of the International Mountaineering association (UIAA) held a conference there. Every September since 1993 the Pan-hellenic Climbing Meeting is organized at METEORA, after most Greek Alpine Clubs request. In 1999 , the 2nd European Climbing Meeting was organized with great success. In the same year the youth committee of UIAA held a conference at METEORA. In 1999 and 2000 the Pan-Hellenic Bouldering Games were organized in Kalampaka. In almost all competitions O.L.K. undertakes all rescues, an indication of the high level of climbing. In 2000, the 3rd Climbing guide was issued by Hasse and Stutte who handed over the climbing field of Meteora to the younger climbers of O.L.K. O.L.K has a rescue team which has been involved in many rescue incidents helping people in need. It also has a team which maintains and changes all old and wear safety bolts so that the field is always one of the safest fields worldwide. The 100 towers and about 700 climbing routes create a feeling of fulfillment to the visitor. Climbing is the only sport that supports the area financially. Surveys show that 1000 people who stay overnight are climbers. If we keep in mind that these people come with their families or friends then we presume the number is bigger. 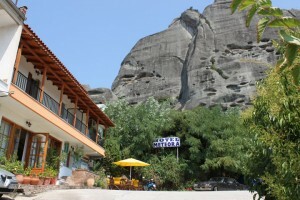 We have not taken into consideration the hikers who come to Meteora. Climbers – visitors give life to the area and to small shops since they are not orientated by tourist agencies. So, the financial benefit exceeds the 500 million a year and makes climbing a financial power for the area. The number of climbers is increasing year by year. All climbing schools have at least one weekend included in their timetable at this peculiar field. There are also many references of mountaineering magazines (and not only) for the good and detailed work that is being done in the field and the influence all over the world is such that it sets as example to others. NOTE: Climbers main commitment for METEORA : We climb on all rocks apart from the ones, where there are inhabited monasteries. A commitment that is kept seriously by everyone.